FOR DEMONSTRATION PURPOSES ONLY. NOT A VALID TICKET. Match any of YOUR NUMBERS to any of the WINNING NUMBERS, WIN the corresponding prize. Reveal a symbol, WIN DOUBLE the corresponding prize. Reveal a symbol, WIN ALL 20 PRIZES INSTANTLY! 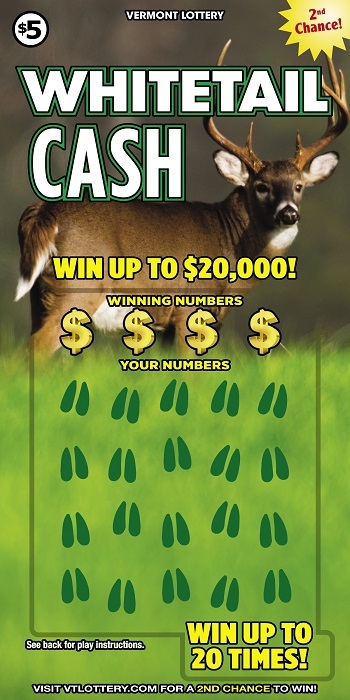 Enter your non-winning WHITETAIL CASH tickets into the Vermont Lottery’s 2nd Chance website for a chance to win a $100 OR $1,000 gift card to a popular outdoor outfitter's store! 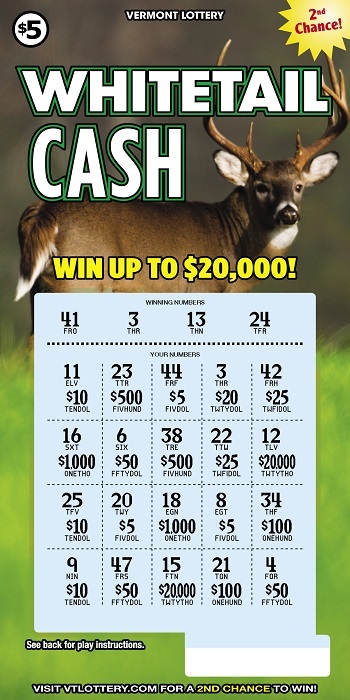 Your non-winning tickets will also be entered in to the Top Prize and Quarterly drawings. Click here to enter tickets or to become a member of our 2nd Chance Club.